The Canadian Food Inspection Agency has uncorked consultations on whether to redefine the clear, neutral spirit and open interprovincial trade for craft distillers who want to try something new. 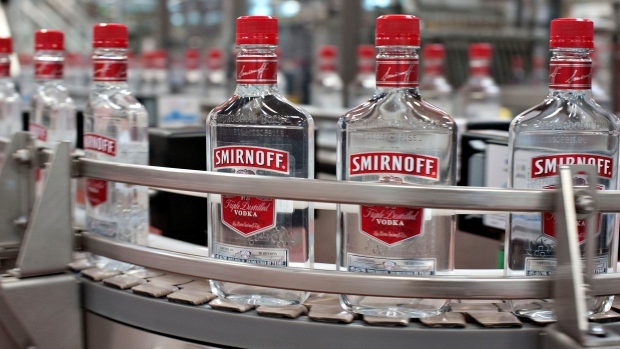 "The current definition of vodka in the food and drug regulations limits the ability of distillers to create innovative vodkas using other ingredients," said Kathy Twardek, who's overseeing the vodka rethink for the agency. Canadian rules are tight. Vodka can only be made from grain or potatoes, must be filtered through charcoal and must be as colourless and odourless as possible. If it isn't, it can't be labelled vodka. But that's not the true spirit of the spirit, said David Farran, president of Eau Claire Distillery in Turner Valley, Alta. "A lot of vodka in the usual European village production was with whatever starchy grain or produce that didn't make the grade for food," he said. "If you were going through Europe and you're tasting vodka, you would get slight variations in flavour from village to village and that has been the tradition of vodka." Craft distillers are now making vodka out of everything from grapes to apples to dairy products. Each source imparts a slightly different character to the finished result. "Nothing is neutral in this world," said Adam Smith of Edmonton's Strathcona Spirits. Even distillers using traditional grains are shaking and stirring the old norms. "We carbon filter it because we have to by law," Smith said. "But we filter it very lightly because we use the best wheat in the world and we don't want to take all the expression of the grain out of it." Such decisions have consequences beyond the martini glass. Eau Claire's vodka was rejected from Quebec shelves because it retains a slight grain flavour. "We can't sell in Ontario, but we sell all through Florida," said Farran. "Snowbirds like it." Jan Westcott of Spirits Canada, the distillers industry association, said his group welcomes the government review as long as labelling rules make it clear to consumers exactly what they're getting. "What (distillers) are doing is reflecting the kind of agricultural products that are available to them," he said. Westcott notes Europe and the United States loosened their rules on vodka long ago. The industry supports making it easier for distillers in one province to sell to their fellow Canadians elsewhere, he said. But vodka is just one example. Similar barriers exist for whisky, he said. "This is a small step (for) the federal government looking at the interprovincial barriers. They've got lots of other work to do." Twardek said Canadian rules for vodka, last reviewed in 1959, are part of ongoing reviews. "We are modernizing our regulatory framework." Beer is going through a similar process. The rules around what can be used in brewing, sweetness levels and the use of herbs and spices are all under consideration. Smith, who sells his vodka in Japan but nowhere in Canada outside Alberta, said it's about time things were opened up. "There are way too many interprovincial trade barriers," he said. "Opening it up, to me, just comes more in line with the global understanding of vodka."